UNIVERSITY PARK, Pa. - A late goal in the final minute of regulation helped the Merrimack College women's ice hockey team stay unbeaten, as a tie Friday night against Penn State helps it to its best start in program history. Location: Pegula Ice Arena | University Park, Pa.
Goal #1 (1-0 PSU) - It took nearly forty minutes before the first goal of the game sounded the horn at Pegula Ice Arena. With 30 seconds left in the second period, Morgan Rolph deflected a pass through the neutral zone. Jessica Adolfsson's stretch pass through to Natalie Heising scrambled Merrimack's defense, and the shot went just below the bar for the 1-0 lead. Goal #2 (1-1 MC) - With under a minute remaining in regulation, senior goaltender Samantha Ridgewell was pulled in order for the Warriors to get an extra attacker on the ice. Senior Katelyn Rae hit the ice, and received a pass from classmate Paige Voight; the shot was a no-doubter, leveling the game at one apiece. - Their 2-0-1 record is the best three-game start to any season for the Warriors; last season, after beating Boston University and Minnesota, the team fell to the Golden Gophers. - After seeing Penn State just twice in the program's young history, every game has gone into overtime between the two teams. - Katelyn Rae has tallied a point in all three games to start the season; she currently sits with three goals and an assist through three games. 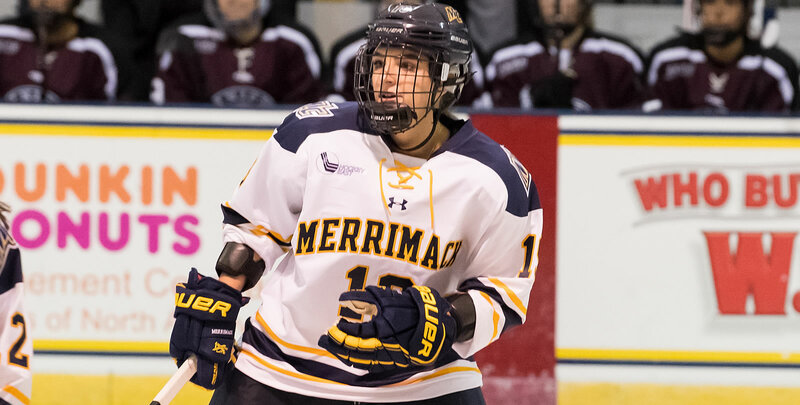 - Merrimack has killed eight power plays through their opening three games. - Samantha Ridgewell made 23 saves, with 11 of which coming in the second period. Merrimack and Penn State wrap up the weekend at Pegula Ice Arena Saturday, October 6, for a 2 p.m. game start.